Courtesy of Athletics Ramirez talks with Ciara Stapp, sophomore communications studies major and pitcher, during a game last season. 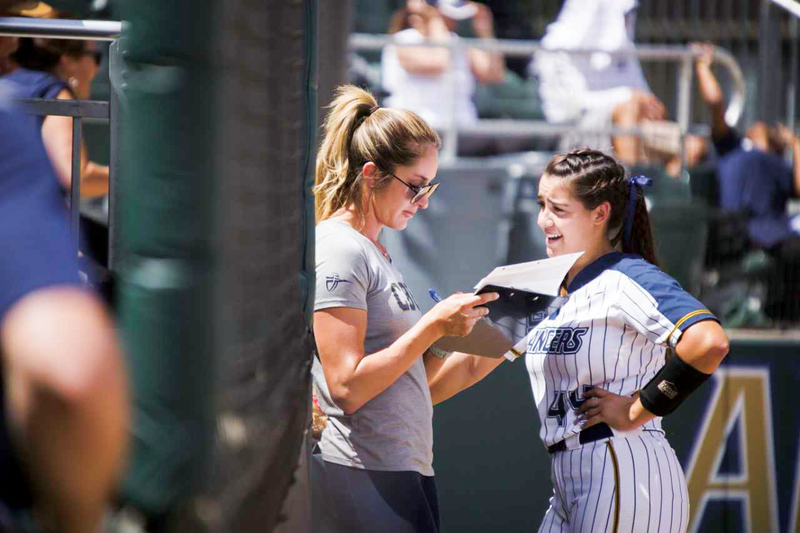 Women’s softball has chosen assistant coach Amy Ramirez as the new directo of Softball Operations. She is a former Lancers pitching star, 2016 CBU Hall of Fame inductee, two-time NAIA Pitcher of the Year winner and two-time NAIA All-American. Ramirez is stepping off the diamond and into her new role where she is still an integral part of the team’s needs. In her two seasons pitching for the Lancers, Ramirez broke many records, including leading softball Lancers with an ERA of 0.83, ranking fourth in wins, placing second in saves with eight, and ranking third in complete games with 53. Bill Baber, head coach of softball, brought Ramirez on as the pitching coach after he was hired in 2011. When deciding on who to bring on to help coach the team, Baber said he knew Ramirez was the best person for the job. Kellye Springstead, junior criminal justice major and pitcher, said Ramirez made a huge impact through coaching and mentoring her. With her new job title, Ramirez is no longer the women’s softball pitching coach. Springstead said Ramirez’s coaching style will be missed. Starting a new position came easy to Ramirez. She said she will miss coaching but is happy to have more time to spend with her family. Ramirez is currently waiting on the arrival of her second child due in 2019. With her new position, Ramirez said she is able to spend more time at home with her husband and daughter. Use my camera in a museum? You bet!